I'm thinking pizza is my favorite food. Seriously. I've certainly written about it more than once. The best part is that since I've started making my own, it's become easier and easier. I can come home from work and have a pizza in the oven in less than hour. How cool is that? Place a pizza stone in the oven and preheat to 450 degrees F.
Place the water in a large mixing bowl. Stir in the sugar or honey and the olive oil. Stir in the yeast. Let this mixture stand for about 5 minutes or until it starts to foam (this way you know the yeast is working). Add three cups of the flour and the salt. Attach the dough hook and knead the dough for about 5 minutes. It should clean the sides of the bowl. If the dough is too wet, add a little flour, a tablespoon at a time. Likewise, add a little water if it's too dry. Place the dough in a well oiled bowl and turn it over so that both sides are oiled. Cover the bowl with a clean towel and let the dough rise in a draft-free area until it's doubled, about 45 minutes. Punch the dough down and plop it on a floured surface ( I prefer my Silpat), then divide it in two. Put one of the halves of dough back into the bowl and cover it back up. The Silpat makes it easy to transfer the dough onto the pizza peel. Put a generous handful of cornmeal on a pizza peel and spread it around. Place the dough on top of the corn meal ---you are now ready to top the pizza. No matter what kind of toppings I choose, I start by drizzling a little olive oil over the top of the dough. At this point you can spread some sauce over the top, but since I'm not a huge sauce fan, I just sprinkle some seasonings on top (whatever I have on hand--tonight it's Italian seasoning, some garlic powder, and a little salt). Put on the toppings of choice. Here, I added sliced tomatoes, onions, fresh spinach, fresh basil, Parmesan cheese and a shredded blend of cheeses. I normally don't measure the cheese, but use about a half of an 8 oz. bag. Get creative. Like olives? Load 'em on. Pepperoni? Go for it. Slide it onto the pizza stone and bake for 10-12 minutes. I had my oven on convection and just had it in there for 8 minutes. Pull out that pie and slice it up. Then do it all over again with your second piece of dough. Don't you love this time of year? Fresh tomatoes, spinach and basil...there's nothing better. And don't forget to save a piece for breakfast. The very first recipe we made in our high school home economics class was one for blueberry muffins. In an effort to illustrate how much better homemade muffins are than the ones made from a mix, our teacher had us do a side-by-side comparison. Unfortunately, we forgot to add the sugar to our homemade muffins. The boxed muffins won the vote by a landslide. Many years later, I finally got it....homemade muffins really are better! Last Saturday we made a visit to Costco and, while I much prefer the fresh fruit at all of the market stands we see here in the summer, I couldn't resist picking up some Costco fruit. Into the basket I tossed a big container of raspberries. A little sugar on the top makes a nice sweet crunch. I haven't made muffins for a while, so I did my Internet search for a good recipe and came up with one from Real Simple. Since I didn't vary any of the ingredients, and the recipe turned out to be very good, I'll just go ahead a post a link: Sugar-Crusted Raspberry Muffins. It didn't take long to make these beauties...45 minutes max. They were still a little warm when I loaded them in a container and brought them over to my daughter's apartment. Why I didn't save a few is still a mystery to me. With my muffin craving still intact, I decided that this time I wanted to make a classic blueberry muffin. Mindful of the disastrous blueberry muffin debacle of my youth, I was on a quest to find the perfect recipe. In the end, I made my own. 1. Preheat oven to 400 degrees F.; line a 12 cup muffin pan with paper liners. 2. In a large bowl, whisk 1 3/4 cups of the flour, baking powder, salt, lemon zest and 1/2 cup sugar together; set aside. 3. In a separate small bowl, toss the blueberries with the remaining 1/4 cup flour. 4. Add the milk, the egg and the yogurt to a large, microwave safe measuring cup. Use a fork to blend the mixture. Microwave for about 30 seconds, or just until the mixture is at room temperature; stir in the butter. Add the milk mixture to the flour mixture and gently stir with a rubber spatula until just blended. Fold in the blueberries. These 6 oz. cups of Greek yogurt gave my muffins a little lemon taste. 5. Spoon the batter into the lined muffin cups. Sprinkle the remaining sugar over the tops of the muffins. Bake for 17-20 minutes, or until the tops spring back when lightly touched. Remove the muffins from the pan and cool on a wire rack. I'm forever battling to find enough light for pictures. I ran these outside to catch the last rays. 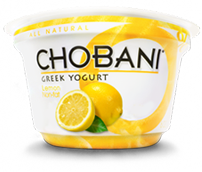 The lemon yogurt adds just a nice taste of lemon. If you prefer more lemon, simply make a little glaze for the muffin tops with lemon juice and powdered sugar. You can omit the granulated sugar on top if you sub the glaze. It all started with a boatload of fresh peas. It's kind of sad that I've lived in Green Giant Country for over twenty years now and I've never made anything with fresh peas. Not even fresh peas. Well, thanks to my friend, Brenda, I can now cross that off of my bucket, baking, cooking list. She brought me two big bags of fresh peas (ironically from a shipment bound for Green Giant)! A few hours and several freezer bags of peas later, I was finished. I had no idea what to do with my peas, however. Boil 'em? Cream 'em? Fry 'em? Really, I hadn't a clue. But modern technology has given us Facebook, and I posed the question to my friends: "What should I make with my peas?" Hmm...not a huge response. Luckily, my friend Emily from Sugar Plum came up with a few suggestions for me. The one that caught my attention: Pea Pesto! It rolls off the tongue, doesn't it? I had to try it. It turns out that making pea pesto is very similar to making regular pesto. Here, I adapted a recipe I found on epicurious.com. Easy Peasy. <----(sorry--couldn't resist). I changed out the penne pasta for cavatappi and added a few basil leaves, but aside from that, and using fresh peas rather than frozen, the recipe is the same. Bring a medium saucepan of water to a boil. Add the peas and cook for 2-3 minutes. Drain well. With the food processor running, drop in garlic and finely chop. Turn off motor and add peas, nuts and cheese, 1/2 teaspoon salt, and 1/2 teaspoon pepper, then process until finely chopped. With motor running, add oil, blending until incorporated. Meanwhile, bring a large pot of salted water (4 quarts) to boil. Add the pasta and cook until al dente, about 9-10 minutes. Reserve one cup of the pasta water before draining . Toss the pasta with the pea pesto and thin as desired with the reserved cooking water. It's like pesto, but it's also like guacamole. I'll bet if I added cilantro and a little lime juice, I could use this with tortilla chips....as it was, my husband and I were testing it out with a couple of spoons. I probably could have made the picture look more appetizing, but I was running out of light. On the other hand, wouldn't this be a good dish for St. Patrick's day?